Dermal fillers or wrinkle fillers are naturally-derived or synthetic materials that are directly injected into skin with the purpose of plumping out the wrinkles, gauntness and depressions folds. The effects of dermal fillers can last anywhere from six months to two years depending upon the type of fillers being used. There are few semi-permanent and permanent types of filler also that can last up up to five and more years or have reported even longer-lasting results. There are different sorts of dermal filler products available in the market, of which Hyaluronic Acid (HA) fillers are the most popular. It is a substance that is naturally present in the human body, which helps in lubricating soft connective tissues, eyes, skin and certain joints. Hyaluronic Acid is also one of the major components present in the synthetic dermal fillers such as Juvederm, Restylane and Teosyal. The report “Global Dermal Fillers Market” for the projected period 2016 to 2021 has been segmented on different types of dermal fillers such as Natural and Synthetic. Each category has further been analyzed on different sub-categories such as Restylane, Sculptra and so on. The dermal fillers market has also been studied on the basis of different applications of the product such as facial asymmetry, Cheek & Chin augmentation, Nose reshaping and many more. The market has also been studied on the basis of different geographies and the level of penetration of the dermal fillers products in those geographies. The demand for minimally invasive dermal fillers such as botulinum toxin have remarkably increased in the past few years, according to a study conducted by the American Society of Plastic Surgeons stated potential adverse effects of dermal fillers, and patient preference are the two major factors driving the latter market. Based on the survey results of the study, experts in Asia recently reported the surge in the preference of soft tissue fillers and injection techniques based on customer experiences, thus pointing towards increasing demand of advanced injectable dermal fillers. USA is speculated to be the largest market for the dermal fillers products followed by United Kingdom. 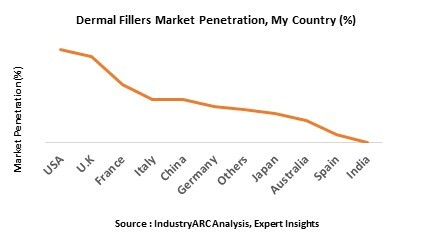 European nations lead the global dermal fillers market in terms of manufacturing and supply of the products. Asia- Pacific and Middle East are the emerging markets for dermal fillers as the users in fashion and film industry in these regions are considerably adopting these cosmetic products for purpose of grooming and enhancing individual charisma. The dermal fillers market report also comprises of the leading companies profiled in an extreme descriptive manner. The company profiles include financial summaries, strategies, recent developments and product portfolios of the leading companies in the dermal fillers market. The report also incorporates a profound study of the market entropy, market forces and strategic analysis of the dermal fillers market.